Not only can you enjoy a peaceful and relaxing holiday at Tandamuki with a glass of our own Shiraz, you can also visit Barry’s sculpture studio where you will delight in seeing his truly unique Australian artwork. 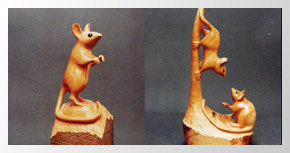 After completing a workshop in ‘Netsuke,’ the Japanese form of miniature carving, Barry decided to combine his love for Australian wildlife with the delicate form of sculpture, to showcase the often forgotten ‘tiny gems’ of the marsupial world. Guests can visit the studio and see how Barry takes a piece of native timber and lovingly carves out some of the most adorable creatures of the Australian bush. 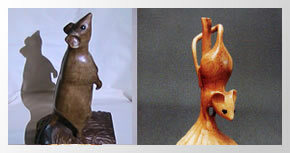 You will see on display the little Wombat, Bettong , Phascogale and Pygmy Possum. Please express your interest in visiting to the studio on your arrival.